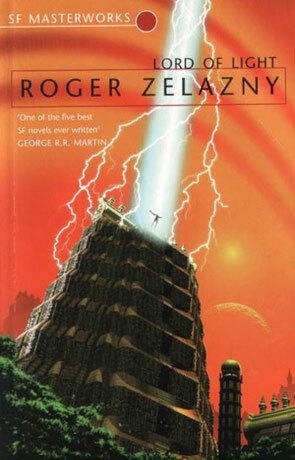 Lord of Light is a science fiction novel written by Roger Zelazny. Reading classics, isn't exactly what I would call a duty, but one should remember to pick up a classic once in a while and see why it became a classic. Some of them are actually quite good! I don't think that I've ever read any Zelazny before, but his 1967 classic Lord Of Light is out in the SF Masterworks series from Orion, so why not. Lord of Light takes place on a foreign world settled by humans a good many generations ago. Since then, the original first has used their control over high-technology to set themselves up as the local gods, using the promise of a new body and possible eternal life, to control the minions. The control system built by the first is built around a mishmash of Eastern religions, and now they have ended up believing their own preaching themselves - well, at least when it comes to the part that says that they are gods. One of the first, he who calls himself Sam, thinks that this is wrong, that technology should be shared, and that man should be free to believe anything he or she wants. And so there's a war in heaven. Lord of Light starts of kind of slowly, but soon warms to its subject, after which there's no stopping Zelazny. I did find the usage of Eastern mythology kind of uninteresting and banal, but luckily that is only the vessel for the story and the story itself is very interesting. Stories about humans who become so powerful that they become indistinguishable from gods, are probably never going to become boring or irrelevant. Humanity defeats the native “energy” beings that populated the orb and establishes a colony on the planet with a Hindu like societal order. Using advanced technology, the crew of the ship transfers their minds into a new body when theirs is near death. They also develop other advances that enable them to form a pantheon with God-like powers. Beneath them are the colonists and even further below in this pyramid of power are the natives. No one bucks the leadership as not only can they technology reincarnate they can convert others into animals. One of these techno-Gods, preferring to be called Sam rather than Mahasamatman, feels that the mistreatment of others is morally wrong. He thinks that he and his peers should share their technology with the lower strata. His peers insist those beneath them are incapable of dealing with godlike powers and need their hand to guide them. Sam never claimed the mantle and though he hates what he feels he must do, this “fallen angel” leads a revolt against his ruling brothers and sisters as he wants to establish a different world order. This is a deep science fiction novel with religious and social overtones. The story line is loaded with action, but also takes its time to defend critical arguments set forth by author Roger Zelazny. The cast fosters the concepts of the plot so that development is targeted more towards an idea than a character. Still with all that this is a cerebral tale that will have readers pondering a host of subjects from comparative religions to white man’s burden to fostering American style democracy in Iraq, etc. in a clever novel that will require concentration or one will miss a point. The writing in this book is beautiful, and it seems that Zelazny has considered every sentence. It deserves the praise it received, though I'm not sure I agree with George R R Martin's comment, claiming that it's one of the 5 best sf books ever written. I picked it up one evening, months after buying it, and by the next evening I had finished all 300 pages. The pace is fast, and there is genuinlly never a dull moment. Some parts can be a little confusing, but then many people through the years have read it again and again, claiming each time to grasp new parts. It is without a doubt one of Zelazny's finest tales, and the depth of philisophy included is outstanding, he obviously did his research! Buddhism is also a major theme. Again I stress the story's richness, the world he has created is far from possible, yet incredibly believable. The blurb on the back sums it up better than I could, and so if you have no idea of the story, stop by a bookstore and have a quick read. It may quickly grow to be one of your all-time favourites, with so many plot twists, and the way it all threads together at the end. I think this book's style is best compared to his acclaimed Amber series. Perhaps that will help you decide. Either way, enjoy! Written on 1st May 2001 by TC.